Geographical characteristics: Cumbuco is one of the best points for sailing in Ceará, and possibly in Brazil. Fortaleza (capital of Ceará) is already known to be a place that has winds, since receiving the “alisios” (trade winds) that blow from Africa, but it’s Cumbuco that really stands out. In the region of Caucaia, the coast is parallel to the equator, from "East > West" and parallel, too, is the direction of “alisios”, trade wind, which passes through Cumbuco with all the power, for it doesn’t find any natural barrier formed by the mainland such as in other stretches of the coastline. 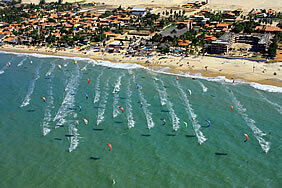 Nautical Sports: In Cumbuco fans of Kite and Windsurfing have space guaranteed by strong wind of up to 30 knots. The beach of Cumbuco and Cauipe lagoon are considered among the best places to learn and practice these sports. Also important is that many of Cumbuco’s hostels and inns have adapted their infrastructures to the demand of tourists that practice these nautical sports. 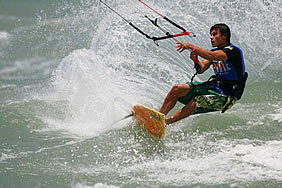 In fact now there are several kitesurfing schools with trained and accredited staff and top quality equipment. The hotels offer transport to the best spots in the region and store equipment. The sport can be practiced in places with different characteristics, flat waters of the lakes or a little more agitated sea. A new hurricane name: Cauipe! The lagoon of Cauipe, with its clean flat water has a very good kite take off and landing area, free of obstacles such as buildings or concrete, just sand and coconut trees. There are some native bars in the southern end. The size of the lake is approximately 20,000 square meters, about 75x250 meters, which may get small in the weekend, due to the amount of windsurfers and swimmers. The best hours are: early from 8 to 11 a.m.and then from 4 to 5 p.m. when people start to leave (and the wind too). During the week, there are kitesurfers alone. 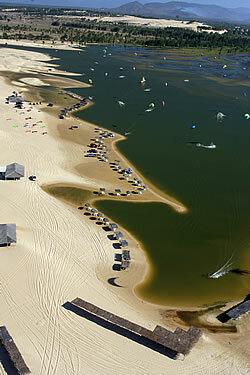 As soon as possible the beginners take their classes and use the lake for the last steps in learning to Kite. The school is in charge of the kitesurfing points. It is a good place to learn the first steps, but be cautious with the traffic of Kites. The climate is good throughout the year with constant winds and temperatures ranging between 27 and 32oC. The best winds are from July to January, the strongest in mid-September. 100% from July to January and 65% from February to June. From July to January it hardly rains; the rain season is from February to April, but it comes in short periods during the day. Getting there: There are three ways to get to Cumbuco: by the beach with a buggy, through the trail that crosses the dunes, but the pavement is not good, or the road at the fork (not shown) a few km after the entry of Lagoa do Banana. Ideal for practicing kitesurf and windsurf for beginners.